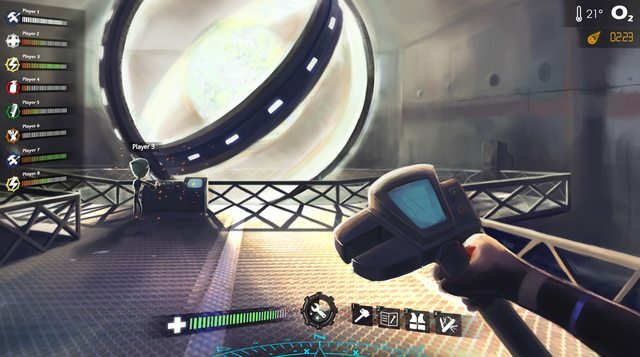 Space Crew is a multiplayer game with first person action and strategy for 2 to 8 players to play cooperatively. Players will be part of the crew of a spaceship in great danger. The spaceship will suffer flaws along it's travel and the objective of the crew is to cooperate in order to keep the ship in one piece until they reach a safe space port. We will have several roles to choose: Engineer, medic, electrician, firefighter, repairman and even an Stowaway. This rol will establish the skills of the player and its ability to repair systems and objects. The game will be won if at least one player is still alive when the spaceship makes an hyperspace jump and reach a safe space port. The game will be lost if every player dies before arriving, and the game will end. 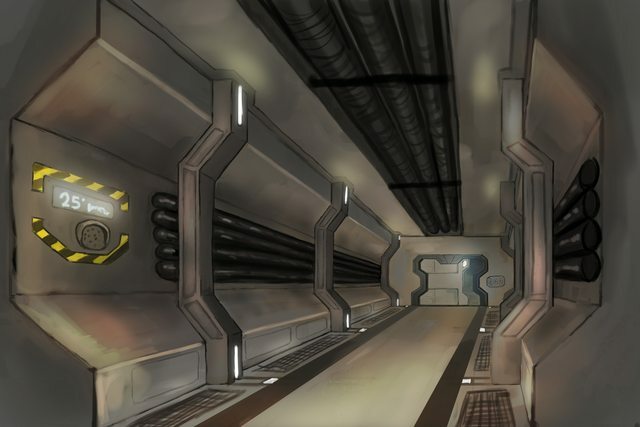 Players will face systems failures in every vital system of the spaceship, like the gravity system, oxigen, temperature, motor and fire extinguisher, and they will even have to face a plague of aliens making a nest in the electrical system! Every crew member is able to repair any system, but efficiency and safety will be different according with the class (or role) and tool that you have at the moment. To repair a system, you should "hit" it to make the progress bar increase. If you release the repair button when the progress bar is at 60%, you will have a 60% chance of having made a successful repair and a 40% of failing your reparation attempt and having wasted your time. The time you spend to repair each system is crucial. The player must take into account every second spent on a system, because as you are repairing something, other systems may be failing and making all your spaceship and its crew in danger. The player will get points for repairing systems, healing mates and performing other tasks that helps the team to fulfill the objective. At the end of the game, you will be able to see how useful have been each player during the game. With the points you earn you can buy new skins to customize your avatar. To unlock some tools you will have to get certain achievements. Engineer: It has theorical knowledge about everything, but he's not speciallist in anything. He isn't that bad either, he is just balanced. Firefighter: Firefighting specialist. Nobody fights flames like him. He is faster and get less damage from it than anyone else. However, repairing stuff is not easy for him. Repairman: He is the specialist in engines and structures of the spaceship. Repairs mechanical failures faster and better than the others, but he's really bad repairing electrical stuff. Electrician: He is the specialist in electrical systems, as control panels and central systems. He isn't very good at mechanical repairs. Medic: He is the only one who is able to heal other crew members. He can heal a limited amount of life points before having to recharge his medic equipment in the medical bay. he isn't good repairing systems or fighting fires. Stowaway: He shouldn't be on board. He sneaked in because he needed a fast transport and he ended up in greater troubles. He isn't good at anything, but he gets much more points than anyone else. The ship would be our map. We can choose between differents ships, changing the playability of the game. It will modify too the difficulty level and the duration of the game. 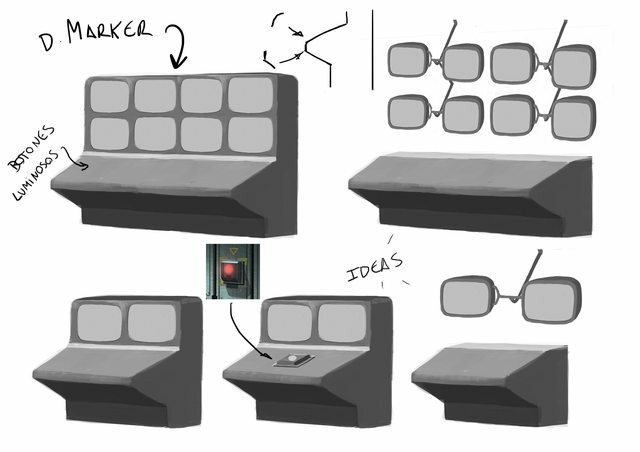 The ship will be composed of different rooms. On each room we can find differents systems that we should try to keep operative as long as possible. We'll have an information panel next to the door. Here we'll be able to see the oxygen level and the temperature of the room among other data. Temperature system: Keep the temperature on a healthy level. If it reach the 0% it won't work very well. The temperature may become too low or too high for the crew. If it's cold, we'll be damaged, other ship's system may freeze, stuck doors and lower the chance of fire. If it's too warm, we'll lost visibility, suffer dizziness and the probability of fire increases a lot. Oxygen system: Generates oxygen in the ship. If the oxygen reach a low level we'll suffer different penalizations like not being able to run. Central system: Is responsible for controlling all the ship's information. it has a great screen where we would see important information of the game like the state of the hyper jump system. Doors system: It make possible the automatic closing and opening of the doors. If it breaks, the doors need to be repaired in order to open it. Driving system: It gives energy to the ship. It's needed to charge the FTL system (Jump system). Gravity system: It provides of an artificial gravity to the ship. If it breaks the gravity can increase or decrease much. The player will have a lot of difficulties to move if this happen. Anti fire system: It extinguish fires automatically. The system allows you seal the room and extinguish the fire pushing a button next to the door. Nursing system: It regenerates the life of the members of the crew and the medic's tool charge. Defense system: It allows to defend our ship from hostile elements...like asteroids. FTL system (Hyper Jump system): It makes possible the hyperspace jump to reach the safe zone. Sensor system: It provides useful information about the ship's rooms. Provisioning system: It provides mysterious boxes that contain a random object or tool... or nothing. Electric system: Is the responsible of providing energy to the entire ship. If it breaks a lot of system may fail or turn off the lights and leave you in the dark. In the alpha version we'll only have available the normal mode. Our objective is reach our destiny before the destruction of our ship. In the future we'll add other modes like the Saboteur where one player will be chosen randomly to disturb the others, but nobody knows who is he. His objective is to prevent the other players from reaching their destination. We'll have a competitive mode called Battleship. We'll fight against other ship, trying to destroy it before they destroy our ship. We have inspired a lot in Team Fortress and it's cartoon style. We want the game to be funny and with a lot of humor sense, very similar to what we find in that game. For the playability, we are trying to innovate all as we can. We haven't found a game similar to this, so we haven't inspired on any videogame to design Space Crew. However, there's a table game that is a clear source of inspiration. We talk about Red November, a mythical cooperative game where our objective is maintain a submarine. 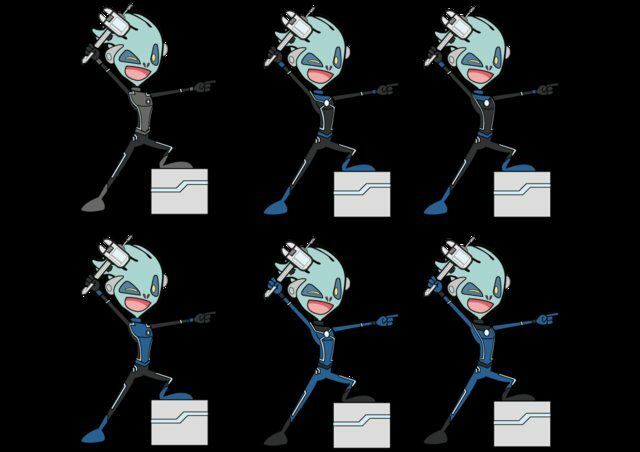 We want that Space Crew have the same spirit, but with our own style and of course, more fun. Ninja Code Studio is a video game studio from Seville. It is compound by students and graduates of Graphic Design, Computer Engineer and Arts. What began as a hobby became a serious project where everyone fight for the same goal: make a living making video games. 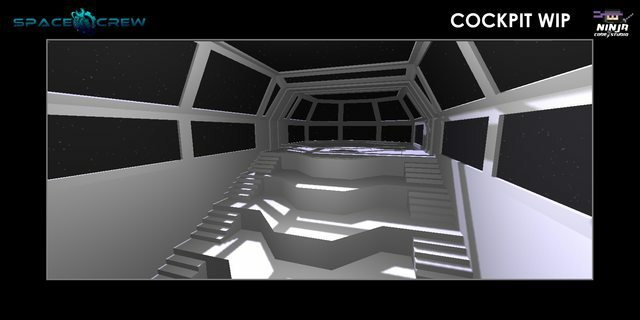 Space Crew is being developed with Unity 3D and Blender. We're going to release an alpha version free for all so everyone can try the game. After we'll have created a bigger community, we would like to commercialize the beta version and its anticipate access. We'll try to release the game on Steam and , of course, in other platforms without DRM. More or less like Kerbal Space Program did. We don't discard other funding options. If you want to know more about us or our project you can visit our web site clicking here! New map, UI and lots of concepts! Space Crew's development is booming. We have started to negotiate the Steam release with one famous publisher and, if everything goes right, it could be released on consoles, so we are very excited for this. We have always dreamed about seeing one of our games in our Steam library. When everything is formalized, we will give further details about the publisher. Today we are going to talk about the new map that we are actually working in. This map is much bigger than the previous one: while the first prototype was designed for 4 players, this map is designed to challenge even 8. It has 4 floors connected by a gravitational elevator and some emergency stairways (we don't recommend using them if you are short of time). 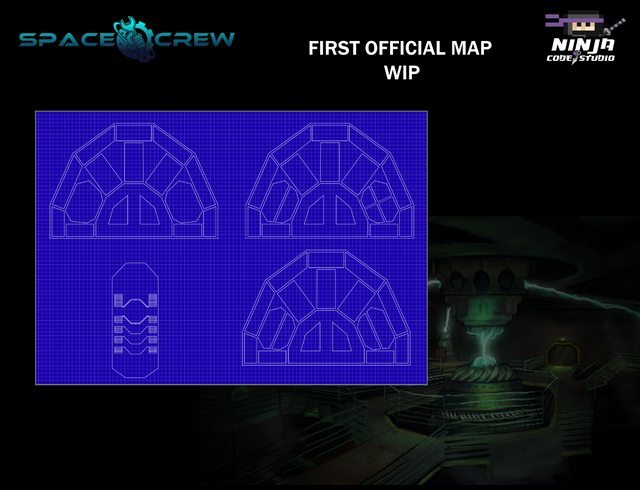 These are the floor planes from the new ship. At the moment, we only have modeled the control cabin (4th floor). This is an advance. We took inspiration from the Sevastopol from Alien with an 50s style (Fallout style). 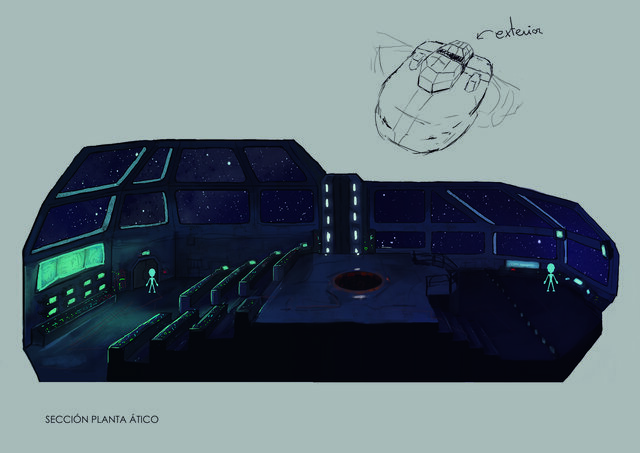 We've redesigned all the systems and added lot of probs to give the ship a great ambience. And finally, last but not least, let’s talk about the interface. We’ve received lot of constructive critics about how we can improve the gameplay and the player interface. This is the result of all those opinions. Now we will always have the temperature and oxygen level visible from the room that we are. We can also see our teammates’ HP and a compass who points towards the closer events. With all this new improvements we hope to solve most of the gameplay problems that we have detected. 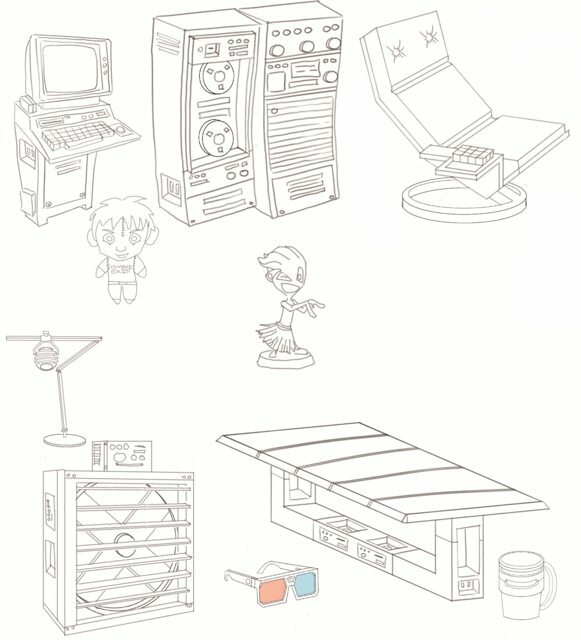 We will discuss in the future about objects and abilities. We hope you like how this is going. If you have any suggestion or you want to participate in the closed alpha, you can contact us through this post or emailing us to info@ninjacodestudio.com. The first Alpha Version of Space Crew has come! New events, 3D models and publishers! Class selection screen, improved splash, BSO and lots of animations. The first iteration of Space Crew is coming to its end. After a few weeks of bugs and hard work, we’re seeing the light at the end of the tunnel. 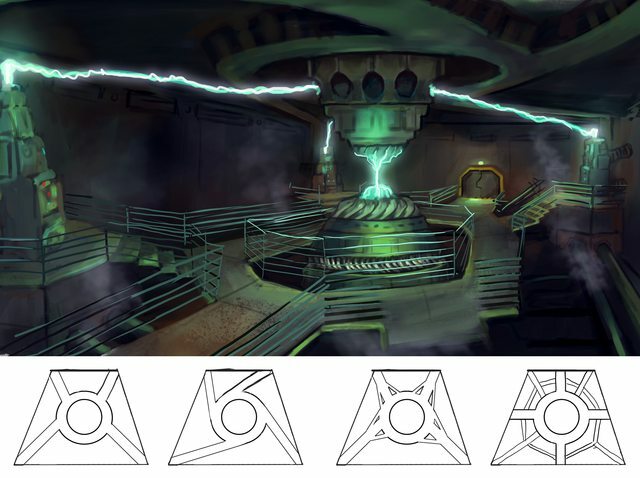 amazing concept art!, i am looking forward to this!